Through all of their faults and failures, Elon Musk and Tesla continue to be the object of industry fascination — and envy. AV safety technology: Why wait? Intel and Mobileye believe they can apply the grand vision of making self-driving vehicles safe to the here and now. You don't get to advertise a vehicle as being "Built in the USA" if it usually isn't, or mostly isn't. 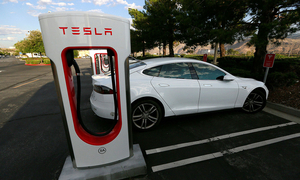 Following protests from Tesla owners, pending legislation in Texas — intended to remove a legal thorn stinging Berkshire Hathaway Automotive — has been altered to alleviate concerns that the electric vehicle maker would no longer be allowed to service vehicles in the state. Achates Power has received $2 million in federal funding to prove that a single-cylinder engine is viable.